Today, with a number of our partner organizations in the US and Canada, we’re unveiling the Climate Test. This is a proposal being delivered jointly to President Obama and Prime Minister Trudeau calling on them to align their governments’ energy policy and decision-making with the demands climate science has laid out for us and the international climate agreements our leaders have forged. Canada’s new Prime Minister Trudeau has also promised a climate test when it comes to reviewing major infrastructure projects like pipelines, a commitment that was reiterated just weeks ago. We support this kind of leadership on both sides of the border – as long as it is ambitious and robust enough to match our promises and the climate’s needs.. We must consider the climate when making energy policy decisions. That’s why we’ve worked with our partners to elaborate this idea further and are excited to be putting it out into the world today. The climate test we are unveiling today calls on our governments to use the latest climate science to evaluate all proposed energy supply and demand policies and projects in light of the globally agreed goal of limiting global warming to 1.5?C, informed by the spirit of global cooperation that made Paris successful. In other words, we’re demanding a reorientation of how we currently assess proposed fossil fuel projects. 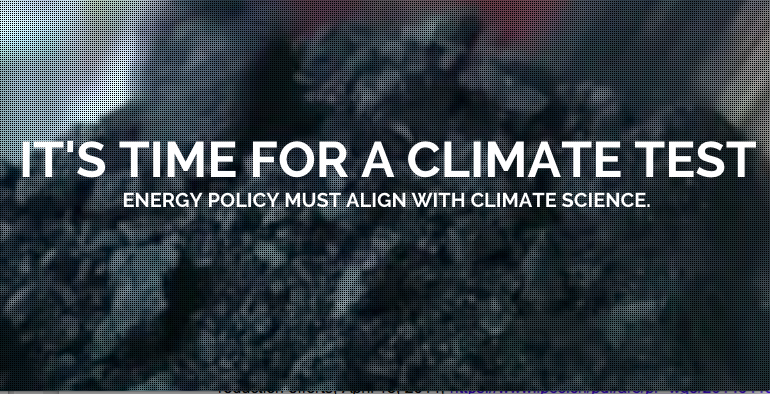 We’re calling on our leaders to base our fossil fuel project decision-making on an assumption of success in meeting our climate objectives, rather than an assumption of failure. Right now, our energy policy is based on an outdated model that suggests business as usual for years to come and thus continued burning of fossil fuels at levels that would mean climate catastrophe. Commonly used energy projections such as the EIA’s Reference Case, the IEA’s Current or New Policies Scenario, or energy outlooks produced annually by oil companies such as Exxon or BP, would see fossil fuel use leading to between 4 and 6 degrees Celsius of warming. Make no mistake, a world with 4 to 6 degrees Celsius of warming would be one we would barely recognize, let alone inhabit safely. Yet, just a few months ago in Paris, world leaders adopted the important aim of limiting global warming to 1.5 degrees Celsius. This was an important achievement and marks a pivotal moment in the fight to save the climate. But if we are actually going to meet that goal, it’s far past time we started acting like it. The Climate Test demands, quite simply, that President Obama and Prime Minister Trudeau show the leadership required to make the lofty goals from the Paris Agreement a reality. The science behind limiting warming to 2?C is clear. The vast majority of proven fossil fuel reserves must be kept in the ground and we must decarbonize our economies no later than 2050. For 1.5?C we must go even further, faster. We must assume success in achieving our climate safety objectives, and work from that assumption when assessing proposed fossil fuel projects. We must apply the climate test. There is No Atmospheric Budget of Carbon, Methane, or Nuclear ! Reykjavik, Iceland – Over the past year, a number of giant, mysterious holes have emerged in Siberia, some as deep as 200 metres. Scientists say the craters may be emerging because the frozen ground, or “permafrost,” that covers much of Siberia has been thawing due to climate change. Allowing methane gases trapped underground to build up and explode ! Permafrost is ground that is permanently frozen, where the ground temperature has remained below 0 °C (32 °F) for at least two years. It covers about a quarter of the northern hemisphere’s land surface. “Permafrost soils contain vast amounts of carbon, nearly twice as much as is currently in the atmosphere. As the permafrost thaws in a warming climate, the soil decomposes and releases carbon to the atmosphere as carbon dioxide and methane. These are greenhouse gases, and they warm the Earth even more. This leads to more permafrost thawing, more carbon release, and so the cycle continues,” Chadburn said. We must Stop the Koch bros,Warren Buffets, and their Fossil Fuel allies from FUKUSHIMIATIZING Us ! Greenland is Melting and Calving Now, Jonas just went over Greenland at above Freezing Temps, for the first Time. “And for the Winter of 2016 it’s possible that the Arctic may never experience typical conditions. For, according to NOAA, the first half of February saw this record, Spring-like, warmth extend on through today. Greenland has 20 Feet of Sea Level Rise ! In Order to Ready Themselves for coming, Record Breaking Rain, Wind and Snow. Food Shortages, High Temps, Floods, Fire, Quakes, and Sea Level Rising 220 feet ! Help Protect Hard Working, Tax Paying, Voting, Citizens from our Koch Bros.,Fossil Fueled Energy and Water Policies ! Over 3 Million Years of Waxing and Waning From the Poles, with the Arctic Keeping North America Cool, Now it is Greenland Because of Fossil Fuels ! Massive Sea Life Die Off on Pacific and Atlantic Coast ! Arctic Region Warming Twice as fast as the rest of the planet ! We Need To Ban Fracking. ?